Kids who love movies and love to talk about them — universal attributes, right, parents? — are being offered the chance of a lifetime as KIDS FIRST! launches our first annual Film Critics’ Search on August 1. We’d like kids to hear from other kids what they think of a movie, so to start things off we’ve selected seven films for them to choose from to share their thoughts about: Tom and Jerry Meet Sherlock Holmes, Diary of a Wimpy Kid, Furry Vengeance, The Twilight Saga: New Moon, The Secret of Moonacre, Jumping for Joy and The Velveteen Rabbit. On our website, KIDS FIRST! will have discussion guides available for each of the films and general tips for youth reviewers. Kids aged six to 15 have until October 10 to send us their written review of their chosen film or films. Upon acceptance of their written review, they will be sent instructions for submitting a videotaped review and have until October 20 to submit that. The videotaped reviews will be posted on KIDS FIRST!’s partner site, WonderWorldTV.com, where the public will vote on the reviews and narrow the field to 20 finalists. The five winners will then be chosen by a panel of celebrity judges. And then they’ll experience life as a film critic for 12 months — being among the first to view new theatrical releases and writing blogs and reviews for KIDS FIRST! and our media partners, and even attending red carpet events and interviewing the celebrities there. Wow! And not only is it fun, it’s educationally sound: Visual media is a pervasive element of contemporary life, and we’ve developed our KIDS FIRST! Film Critics program to encourage an active rather than passive response — a vital visual literacy whereby kids learn to critique as well as write reviews about media they enjoy. KIDS FIRST! Film Critics’ Search will culminate in a grand finale Film Critics Weekend (November 12 – 14) that will include a KIDS FIRST! first as we attempt to set a world’s record of one million kids “viewing and reviewing” the same film on the same weekend, together with a caring adult. Imagine! A million kids riffing on the same film at the same time. The Velveteen Rabbit has been chosen for this record-breaking event. A discussion guide to help parents and kids explore ideas in the film is available on the KIDS FIRST! website. Our sponsors are as enthusiastic about KIDS FIRST! Film Critics’ Search as we are. Feature Films for Families will present a $10,000 scholarship to the best review of their film, The Velveteen Rabbit. Each of the five winners will see their review posted on WonderWorld’s website. Starz Kids & Family Channel will be playing The Velveteen Rabbit throughout the campaign and on the Finale Weekend. DVDs of all the search titles will be available at Toys R Us and online at Amazon.com. Campaign support comes from national nonprofit organizations that include the National Education Association, Reel Fathers, National Association of Elementary School Principals and the National Council of Women’s Organizations, with a cumulative 17+ million members. Stepping Stone Media is donating a percentage of The Velveteen Rabbit DVD sales to KIDS FIRST! and to any nonprofit organization that becomes an affiliate of the campaign. Visit http://www.kidsfirst.org/become-a-juror/FilmCriticsCampaign.html for more information about the KIDS FIRST! Film Critics’ Campaign, discussion guides for each of the seven entry choices, and guides for creating both a written review and a video review (to be available by Aug. 1). Also find information on fundraising opportunities for organizations through the KIDS FIRST! affiliate program. Created as a forum for tweens to voice their ideas for positive social change, “Anni Zola” is a mock pop idol-based online community hosted by its namesake, Anni Zola. The virtual star, whose name means “beautiful earth,” is more than a captivating singer and dancer – she encourages her fellow tweens (she’s 14) to help make the world a better place by sharing her dreams and welcoming theirs on her website. And “she” has just released a CD, Anni Zola — My Story, with a super selection of songs and stories that reflect her social awareness, available on her website and through Amazon.com and other major retailers. Approximately 32 minutes of song and narration comprise the “My Story” audio that is the CD’s main component. The storyline weaves each track into one coherent performance, as Anni Zola talks about what her life is like on her planet of Orfea, and then in her songs expands on some of the themes she’s expressed (ecology, bereavement). With age-appropriate language free of innuendo, the recurrent message is “be aware” and “believe you can make a difference.” But there’s a refreshing recognition of human imperfection, and even as Anni Zola encourages her friends (listeners) to “reach for the sky,” she shares her own misgivings about being good enough to live up to others’ expectations and her mother’s reassurance that “you don’t have to be perfect” to make a positive contribution to the world. The enhanced CD also features a four-minute video of Anni Zola performing one of her songs — a pop-concert treatment with video screens filling the stage behind Anni Zola’s choreographed dancing. And among the extras is an animatics video that shows how a dancer’s real moves were translated into the anime-inspired animation. Wallpapers and calendar also feature the dynamic artwork and vivid color that characterize the product throughout. On the website that spawned the CD, Anni Zola uses the social networking platforms to share her message through blogs and tweets, and the site’s visitors can likewise interact with her and each other about their volunteer activity and the causes most important to them. And Anni Zola will choose some of these ideas, causes and volunteer actions to incorporate into the storyline of upcoming webisodes and Facebook game. Submit by Aug. 20 to be considered for the webisodes and game now in production for launch later this summer and fall. Another current project is Anni Zola’s BYOB (Bring Your Own Bottle) Challenge. Deadline is Aug. 30 for kids to submit their creative solution to the wasteful excess of disposable water bottles. Winning designs for a reusable water bottle will win not only recognition on the Anni Zola website for their creators, but will be mass-produced as Anni Zola website exclusive merchandise. KIDS FIRST! flipped over Oscar®-nominee Rob Reiner’s new movie, “Flipped” from Castle Rock Entertainment and Warner Bros. Pictures. So much so that we’re working with two of our film festival partners to host special preview screenings and inviting you to see the movie for FREE. Be sure to RSVP early — advance reservation is required, and it’s first come, first served — but we expect more people than there will be seats for, so please plan to arrive early. While the movie will hit theaters in two weeks on Aug. 6, you can see it prior to the release date in Austin, Texas, or Newport Beach, Calif. KIDS FIRST! 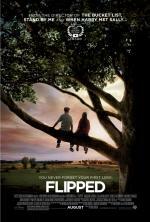 and the Austin Film Festival will screen “Flipped” on Sunday, July 25, at noon at the Regal Arbor 8 Theater; KIDS FIRST! and the Newport Beach Film Festival/Orange County Film Society will screen the movie on Wednesday, July 28, at 7:30 p.m. at the Regency Lido Theater. To register for reservations at either city, go to http://kidsfirstjuly.ennectSweeps.com/FlippedReservations or http://www.kidsfirst.org/ and click on the banner for “Flipped” reservations. The 90-minute coming-of-age film, rated PG by the MPAA for language and some thematic material, follows Bryce and Juli from second grade — he, girl-shy; she, sure that it’s love — to junior high. We share their triumphs and disasters as they navigate family drama and first love, making the discoveries that will define not only who they are, but who they are to each other. “Flipped” stars Madeline Carroll as Juli, and Callan McAuliffe as Bryce. Rebecca De Mornay and Anthony Edwards star as Bryce’s parents, Patsy and Steven Loski; and Emmy®-nominee John Mahoney as his grandfather, Chet Duncan. Penelope Ann Miller and Emmy®-nominee Aidan Quinn star as Juli’s parents, Trina and Richard Baker; and Kevin Weisman as her Uncle Daniel. “Flipped” is directed by Oscar®-nominee Rob Reiner and produced by Reiner and Alan Greisman, who most recently collaborated on “The Bucket List.” The screenplay is by Rob Reiner & Andrew Scheinman, based on the novel by renowned author Wendelin Van Draanen. Martin Shafer, Liz Glotzer and David Siegel serve as executive producers. The creative team includes Emmy®-winning director of photography Thomas Del Ruth, production designer Bill Brzeski and Oscar®-nominated editor Robert. The music is by five-time Oscar®-nominee Marc Shaiman. The costumes are designed by Durinda Wood. · This cinematic, interactive storybook app features characters from Toy Story 3. · Two interactive reading modes allow kids to follow along as the story is read aloud, or explore at their own pace. Children can also select ‘Younger Reading Mode’ to simplify page turning. · Kids can see the story pop off the screen with fantastic 3D effects. Free 3D glasses are available at Disney Stores, available exclusively in the United States and Canada. · Children can play exciting games based on scenes from Toy Story 3. Kids can watch Woody soar above the town, help him to safety in “Hang Glider,” and have a blast with Buzz as they overcome thrilling obstacles in “Falling with Style” – also in 3D. · Children can record their voice reading the story and hear it played back as narration. · Children can tap characters and objects for sound effects and fun surprises. · An interactive coloring feature that lets kids finger-paint and share their masterpieces with friends and family. · Kids can sing along to songs from the movie. · A visual page index allows kids the ability to jump to their favorite page. · Children can turn pages manually and move back and forth through the story as they wish. The “Toy Story 3” app for the iPad is $8.99 and comes with a one-month free subscription to disneydigitalbooks.com. Consumers can download “Toy Story 3” directly from the App Store on the iPad or at http://itunes.apple.com/us/app/id377544475?mt=8. The “Toy Story” read-along app, the “Toy Story 2” read-along app and “The Princess and the Frog” read-along app can also be directly downloaded from the Apple App Store. You are currently browsing the KIDS FIRST! News weblog archives for July, 2010.